This REPLACES the aluminum desk featured in previous catalogs. Slim profile storage clipboard doubles as a desk on the road! Holds a substantial stack of 8.5" x 11" paper (pictured here with the American Farriers Journal Supplies and Services Directory and room to spare!) Outside the high-tension rubberized clip keeps a grip on your current paperwork, inside, a velcro document belt secures the whole stack. 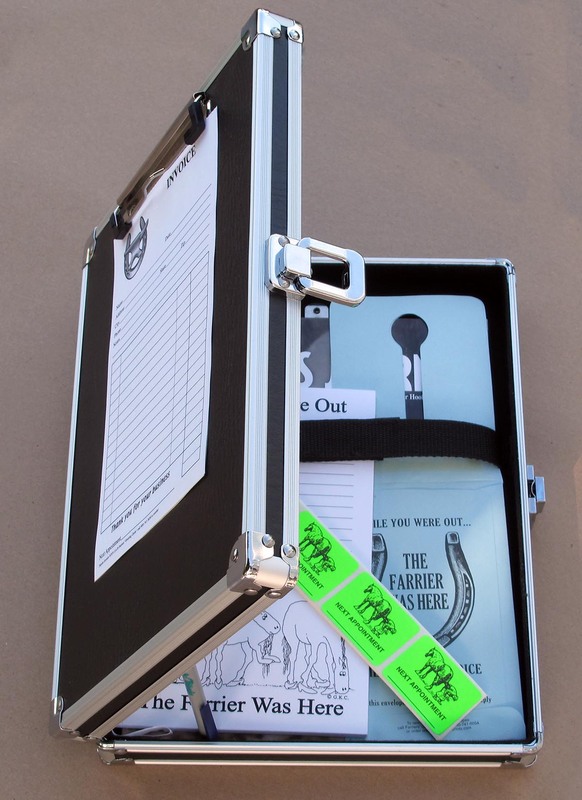 Left hand inside is outfitted with mesh pockets to corral small items like business cards, pens, checkbook, etc. It's constructed of sturdy fiberboard that's covered with black water-resistant vinyl and reinforced with metal on corners and edges for durability. There's a keyhole slot on the back to hang it up if you're so inclined AND the latch mechanism includes a key lock for security. Outside dimensions are 12.5" tall x 9.75" wide x 2.25" thick. Example products pictured are NOT included.